Description: Conrail ME2 heading west to County at New Brunswick on the NEC. Description: A couple of Locos deliver to Raritan Center. Description: A Conrail Shared Assets Metuchen job with a pair of former Conrail GP's working in Raritan Center. Title: NS 18G @1213 hrs. Description: Eastbound manifest led by ex-Conrail #6180, ex-CR/PC #8041, NS rebuilt from GP50 #7056, and ex-CR/PC #8081. Description: CR ME18 (I think) heading west through New Brunswick to work at County. Description: Norfolk Southern GP38-2 #5283 leads the SA31 through Red Bank NJ on the North Jersey Coast Line and is about to leave the NJCL for the Southern Secondary. Description: The Conrail SA31 leaves Gold Lumber with the PRR 5283. Description: The SA31 rounds the bend in Farmingdale to go back against the train on the Southern Secondary. Description: The SA31 laying over beside Dinaso & Son Lumber in Lakewood, NJ. Description: The SA31 sitting in Lakewood, NJ just before dawn. Description: The Conrail Shared Assets train SA31 laying over in historic downtown Lakewood, New Jersey. Description: This white faced former Conrail GP38-2 does not have a horsehead logo on the long hood. Description: Norfolk Southern GP38-2 #5283 leads the SA31 through Red Bank NJ on the North Jersey Coast Line this time running short hood foward and is about to leave the NJCL for the Southern Secondary with 8 cars and the Shoving Platform. This my Second encounter with Norfolk Southern GP38-2 #5283. This locomotive has been assigned to the Southern Secondary for a long time now. 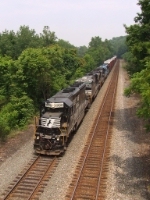 Description: A closeup photo of Norfolk Southern GP38-2 #5283. Notice that the area near the numberboards are white even though the locomotive is not painted in the NS Horsehead paint scheme. Description: 19G with road and local power heads westbound at the end of the day. Description: A swing by Metuchen Yard on the Fourth of July finds three former Conrail four axle units and a Conrail hack. Description: The line up of engines and a Conrail caboose at Metuchen Yard on the Fourth of July. Description: He narrowly missed a "goose strike"! 2 Canadian geese decided to cross right in front of the train, but repeated horn blasts got them to "speed it up a bit"! Description: Coming out of Staley, I just made it in time! Description: Climb'in the grade behind Ben's Deli. Description: Coming out of Staley onto Delmorr Ave. Description: View of 5290's graphics. Glad its so clean too! Description: Switching at Toll Bros., long hood out!